Not much is more exciting for a beekeeper than having the opportunity to set up a new hive. And, it is very saddening to find a hive that has died. We call these dead hives – “dead outs”. And our first response (or at least second – if you are a crier – like me) is , why do I have a dead beehive. Yes, the bees are gone and the hive has failed. But why do I have an empty hive? Could this have been prevented? Is it my fault the bees died? It is time to perform an autopsy of the hive. How does a beekeeper know that they have a dead beehive? Good hive management requires routine inspections of what is happening inside the hive. Taking the time to quietly walk by the hives can tell the beekeeper a lot about colony conditions. A bee colony that has previously had a lot of flight may show greatly reduced activity. Perhaps, this colony is growing weaker or maybe it has swarmed. 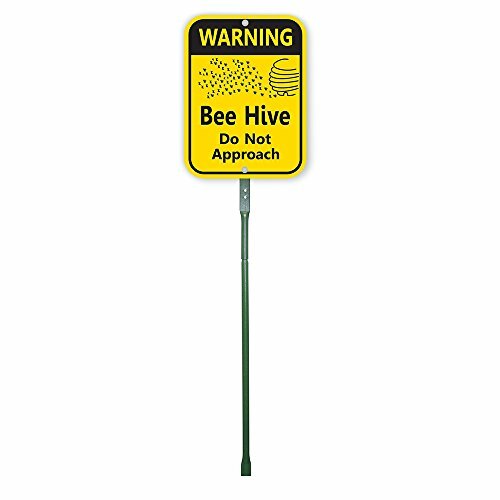 Either one of these conditions require a check inside the hive to access the situation. Honey bees are industrious little rascals and they are “all about” their hive. Strong hives will rob food from smaller, weaker hives. You may notice a frenzy of activity at the hive entrance (that goes on for more than 15 minutes) this could be robbing. Putting on your veil for a closer look, may reveal wrestling bees at the front of the hive. There are techniques you can use to prevent or slow down robbing. But any colony that has been attacked should be checked at a later date to ensure queen survival. One of the saddest methods of discovering a dead beehive is to open the box and find it empty. I have had this happen often enough over the years – to understand your pain. It’s a feeling of disappointment, sadness and even a little guilt. Did I do or not do something that would have made a difference to this bee colony? If you notice or suspect problems in your colonies, it is imperative to check inside as soon as possible. There is no way to truly know the condition of the bees without an inside hive inspection. Do you have a sustainable population? Is the queen present and laying? Do you have a good brood pattern? Do the bees have pollen and honey? A strong colony that has swarmed will show reduced flight and activity until it rebuilds. Usually, a queen cell is left behind to become the new queen. If she matures, mates well and begins to lay a good pattern, this colony will recover. Sometimes, dead beehives can be prevented by helping weak colonies to thrive. You may hear beekeepers say to let weak colonies die and only keep the strongest. While this is good advice from a genetic point of view, it is hard to do. And the bees are not always to blame. Weather conditions can have negative effects on honey bee colonies. The best genetics in the world wont help much if the bees are starving. When a honey bee colony loses its queen, it is often able to produce a new queen bee. This is nature’s plan and it works an amazingly significant amount of the time. However, if the worker population has dropped to a low level or weather conditions do not favor mating, requeening is the best option. The beekeeper who puts a new mated queen in the weak colony may be preventing a dead beehive experience. 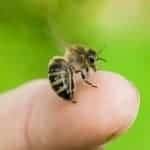 Beekeepers can also feed honey bee colonies. Perhaps, they are short on stored food due to drought, frost, etc. The beekeeper with more than 1 hive, may be able to a weak hive an extra frame of brood. It is important to understand that beekeeping involves colonies failing. And that is true today more than ever. If you keep bees, you will experience a dead beehive. Sometimes there is nothing you can do to prevent the collapse of a colony but not always. In my experience, thankfully, disease has not played a huge role in beehive deaths in my apiary. However, others have not been so lucky. Many of the bacterial diseases can be spread from one hive to another. This is caused by bee flight or beekeepers sharing tools. Our colonies often recover from these diseases but American Foul Brood is a serious problem in some areas. 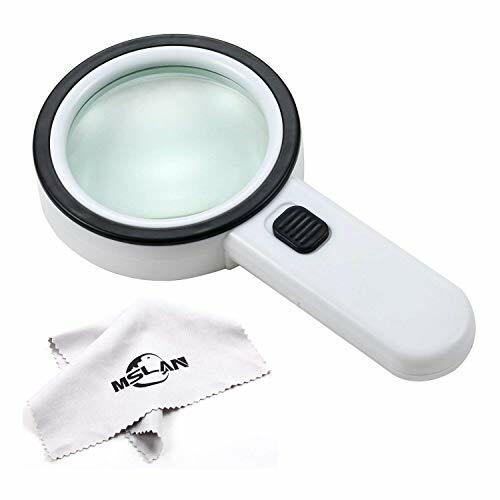 Practicing good hygiene (not using your hive tool at someone else’s house etc.) and avoiding used equipment will help you prevent American Foulbrood. But any time you have a dead beehive, you should give a thought to the possibility of Foulbrood. Some states require that beehives infested with American Foul Brood be burned. It’s that serious. I often hear beekeepers say that wax moths killed their bees. No, they really did not. Wax moths fly into weak or dead beehives and lay eggs on the comb. Normal colonies evict the eggs or larva. Weak colonies or dead hives with no protectors become a breeding ground for moths. The moth larva tunnel through the comb and leave behind webbing and feces (called frass). The wax moths did not cause your dead beehive. But why was the hive weak or empty to begin with? 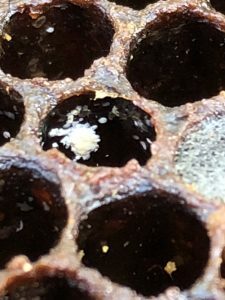 Varroa mites leave clumps of feces behind inside infested cells. 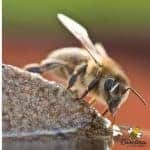 If you have been involved in beekeeping for any amount of time you are familiar with varroa. These external mites are the #1 killer of honey bee colonies worldwide. Not only do they weaken bees by feeding on their blood, they also spread disease. Most untreated colonies infected with varroa die within 2 years. And then, the mites hitch a ride on robber bees and spread to other colonies. I have some good posts on mite treatments. (You can read more – here). The important thing to remember is that none of the treatments work 100% of the time. Some mite control methods have temperature restrictions (very difficult for those of us in the hot South that want to stay organic). Many need to be applied more than once. No mater which option you use for treatment, you must recheck the mite levels of your colony to verify success. I love my honey bees and I take my stewardship of them seriously. However, they are not my total life. And, I suspect you could say the same thing. Like many of you, I have work, home, family obligations etc to consider. Unfortunately, varroa mites don’t care about my schedule. They don’t care about any excuses. 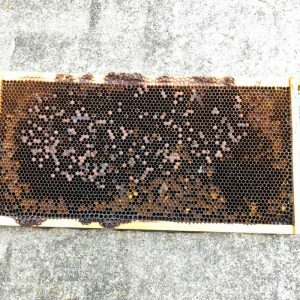 I purchased a nuc this Spring that brought varroa with it. (I’m sure they were already here too!) I did treat with Oxalic Acid (which has been working well for me) but I obviously was not aggressive enough. And with the horrible humid, heat we have had this summer, I did not notice a serious problem until it was too late. Late one evening, I noticed what might be robbing going on outside one of my hives. The next morning I did an inspection to find the colony dead. The video in this post outlines my autopsy of this dead beehive. Why did these bees die? Well here is the truth. This hive died because I didn’t do what I should have done, when I should have done it. It’s my fault. I am the beekeeper. I am the steward of the bees. And, many times it is our fault but beekeeping isnt easy. No one is perfect. 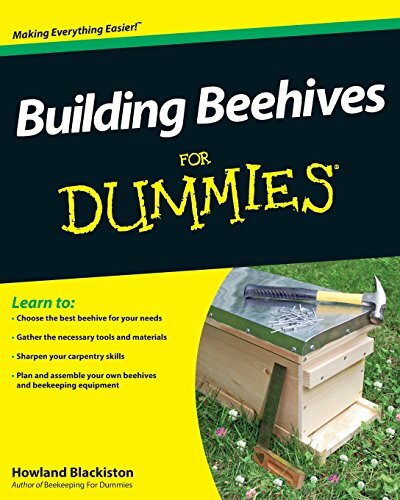 Learn from mistakes and grow in your beekeeping knowledge. I say to you that if you keep bees for any amount of time, you will have a few dead beehives. We must try to learn from them and do better in the future. My focus now will be to salvage my drawn comb to prevent wax moth damage and use it help help a new colony next Spring!